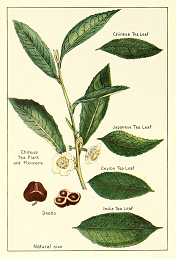 This conference explores the cultural, religious, botanical, economic, and environmental dimensions of the global spread of Camellia sinensus, commonly known worldwide as either tea or chai. Dried, fermented, ground, steeped, poulticed, eaten, and imbibed, this plant has had a global impact on local economies, forest ecologies, culinary traditions, religious rituals, labor migration, and transoceanic trade. Our conversations will examine the multiple ways that tea is produced, distributed, consumed, represented and ritualized across Asia, from its ancient origins in the Himalayan hills of China and Assam to its global spread in the colonial era to its current status as both daily staple and healthy alternative. This interdisciplinary conference considers tea from a range of scientific, humanistic and social science perspectives, focusing on how tea monoculture displaces native flora and fauna, how tea rituals embodying cultural traditions and heritage, how tea plantations rely on impoverished migrant labor, and how tea companies market this ubiquitous leaf in multiple ways. Our meetings include samplings of the many forms this single plant can take, pairing teas with associated Asian sweets and snacks.